Share the post "Gardenia Jasminoides Or Cape Jasmine – Fragrant Evergreen Shrub"
This East Asian native is a superb evergreen shrub for warmer climate gardens. They’re the aroma of romance and soft summer nights. Flowers may be single, semi-double or double depending on the cultivar. Dwarf, cold-hardy, and variegated cultivars are also available. All gardenia types have two things in common: their luscious powerful fragrance and lovely, waxy white flowers, which bloom over a long periods. Their neat, dense form and glossy, dark green leaves provide landscape interest year round. Flowers are followed by small oval fruits. 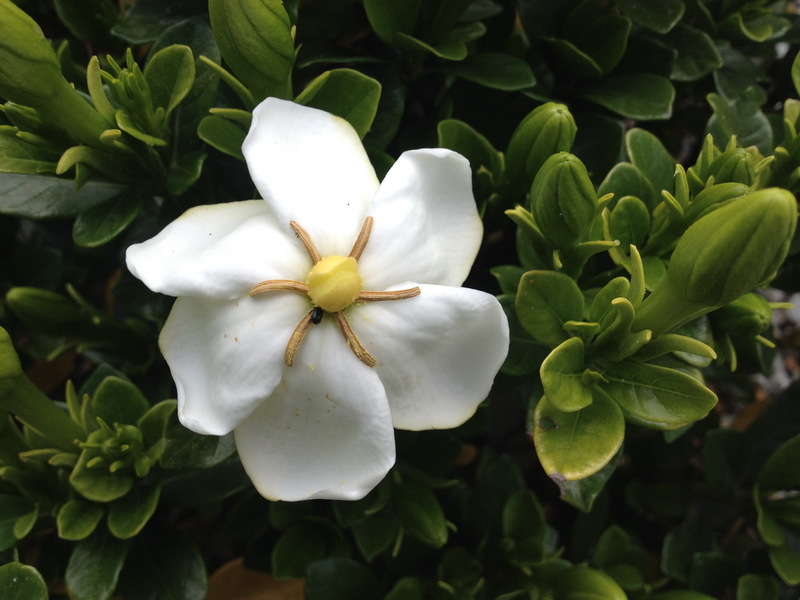 As a subtropical plant, Cape Jasmine thrives best in warm temperatures in humid environments. Getting those conditions is rather hard in temperate latitudes, so that’s why in colder temperate zones gardenias are usually cultivated as houseplants (container grown) or in greenhouses . Most types of gardenias in the United States stem from the early Gardenia augusta. Cape Jasmine has been in cultivation in China for at least a thousand years (evidence of Gardenia jasminoides in cultivation in China dates to the Song Dynasty (960-1279 AD)), and was introduced to English gardens in the mid 18th century. Many varieties have been bred for horticulture, with low growing, and large-and long-flowering forms. 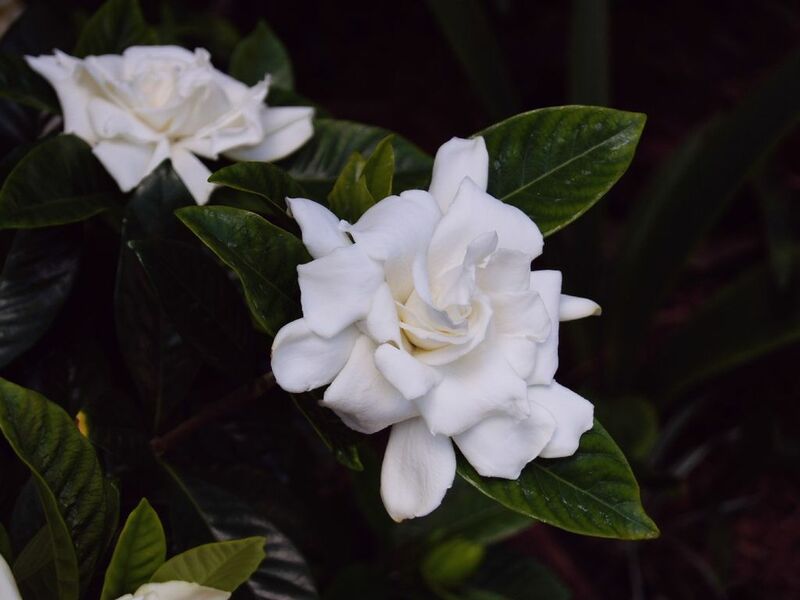 • Gardenia ‘Radicans’ is a double-flowered cultivar and a low-growing groundcover which reaches 15–45 cm (6–18 in) and spreads up to a metre wide. • Gardenia ‘Grandiflora Star’ (single flowers) is an ideal plant for a pot or a semi shaded spot in the garden. More compact than its cousins (0.5m H x 0.5m W.), with rich green foliage a strongly fragrant brilliant white flowers. Flowers appearing from late spring. Cold hardy. • Gardenia ‘Fortuniana’ is a double-flowered cultivar. • Gardenia ‘Mystery’ is a double-flowered cultivar. The plant has a large upright habit and has been a popular variety good for hedging. It reaches 1.8 to 2.5 m (6–8 ft) high and wide. • Gardenia ‘Aimee’ is an early-flowering (spring) form. • Gardenia ‘Shooting Star’ and Gardenia ‘Chuck Hayes’ are cold-hardy, roughly to zone 7. • Gardenia ‘Summer Snow’ is distinguished by its large flowers and grows in USDA Zones 6-10. • Gardenia’Crown Jewel’ is a dwarf spreading variety, that has survived several weeks below zero in Zone 6. • Unlike other varieties, Gardenia ‘Golden Magic’ bears flowers which change to a golden yellow relatively early after opening white. It grows to 1.5 m (5 ft) high and 1 m (3.5 ft) wide. • Gardenia ‘Kleim’s Hardy’ is another hardy type of gardenia, with six single petals to each flower with bright yellow stamens. Its large, shining leaves enhance its rounded growth, which can reach 2 to 3 feet tall and wide. • Gardenia ‘August Beauty’ has large double flowers up to 3 in across and is one of the most frequently found varieties of gardenia. It flowers in early summer and sporadically into fall. It is a large shrub, growing to 6 feet tall. It is cold hardy, growing freely up to USDA plant hardiness zone 7. • Gardenia ‘Aimee Yashioka’ is an old-time gardenia, known for its intense fragrance and gorgeous ivory-white, double blooms that can reach four to 5 in across. These are the specimens that gave the species its reputation. This is a fast growing cultivar that can reach 12 feet or more and blooms twice during the growing season. Native: originated in Asia and is most commonly found growing wild in Vietnam, Southern China, Taiwan, Japan, Myanmar, and India. Light: Prefers bright indirect sunlight or partial shade. Soil: Acidic soil with a pH between 5 and 6.5 (if the soil is not acid enough, many of its nutrients (especially iron compounds) will not be available for the plant, since they will not dilute in water and therefore will not be absorbed via the roots. If this happens, gardenias start to develop chlorosis, whose main symptom is a yellowing of the leaves). Well-drained. Soil high in organic matter. Moist soil. A potting mix rich with peat moss or humus is ideal added at the time of planting. Moisture: Gardenias love humidity. A high degree of humidity is also essential when flower buds are forming. Use a room humidifier or place the pot on a tray of wet pebbles, or peat moss and spray plants at least once a day with fine mist-spray, using water at room temperature. With gardenia care should be taken to mist the foliage, and not the flowers, because water on the petals causes discolouration. Dry soil will cause the buds to drop. Keep the soil moist but not soggy, which can also cause buds to drop. Consider to place a 5 to 8cm (2-3 inch) layer of organic mulch to help the soil maintain moisture. Flower Color: Waxy white/creamy flowers in summer. Ages to yellow. • The fruit of gardenia jasminoides is used as a yellow dye, which is used for clothes and food. • Polynesian people in the pacific islands use these fragrant blooms in their flower necklaces, which are called Ei in the Cook Islands, Hei in French Polynesia and Lei in Hawaii. • Gardenia jasminoides fructus (fruit) is used within traditional Chinese medicine to “drain fire” and thereby treat certain febrile conditions. Fertilizer: Gardenias require fertilisation twice in a year to maintain dark green leaves. Fertilise during early spring (before the flowers appear) and during early summer. Use an iron chelate fertilizer and mix with an acidic soil mixture. Only fertilize when watering to avoid fertilizer burn. • Do not to water gardenias with very hard water. If the water is hard, add some vinegar or lemon juice to it before watering your plants, this will lower the pH of the water. Or use an effective pH modifier, like phosphoric or nitric acid. • Iron chelate can be added to the soil in order to lower the pH, but care must be taken since an overdose can kill the plant, as with any other inorganic soil amendment. • Some gardeners will spill vinegar over the soil to effectively keep the pH low and prevent chlorosis. This can be carried out either regularly or when the first symptoms of chlorosis have been spotted. • If exposed to cold and strong winds, the plants may get a winter burn. Protecting the gardenia from cold winter winds helps to prevent tip dieback in the colder areas of its hardiness range. • Good air circulation will reduce pest problems. • Cape jasmine requires little or no pruning. If needed, prune after flowering with sharp pruners . • Pull weeds from around Gardenia jasminoides in garden carefully as plants roots are shallow and can be damaged easily. Do you grow Gardenia jasminoides (Cape jasmine) in your garden? What is your experience with this plant? Please share with other fellow gardeners in the comments below! Do you sell Gardenia jasminoides (Cape jasmine) seeds or have plants for sale? You can place your advertisement here. Contact us now!